Not too bad. His doctor told me to have him stick to just a few kinds of food, so that if he had a reaction, we’d know what caused it, but how do you keep his diet balanced then? Is it something that I don’t have to worry about yet? So far, we’ve been doing one food for a couple days and then moving onto something else. Is a couple days long enough for a reaction to happen? I would think so, but what do I know. Haha, this post was not originally going to be about baby food. I was going to write about the plague being mostly gone, and how I’m updating my twitter (@retrokitty) again at work, and how I’ve been distracted by social media & commenting on blogs, and that is why I haven’t posted. Normally I’m not much of a blog commenter, but I have decided to try and be more social. Now, I just have to find a balance. The other thing I was going to say is how I’m really tired today because The Munchkin woke up early (30 min before my alarm was supposed to go off, grr.) and I just feel like going to sleep. 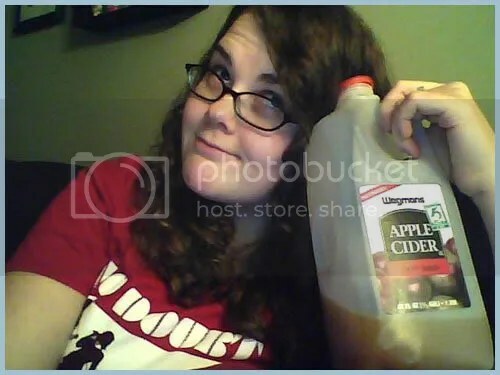 Instead, I’m waiting for John to sign onto gmail and drinking apple cider from the carton. Keeping it classy!